For award competition, the Trust developed questionnaire form. Questionnaire were circulated among the FMIS. They filled in the questionnaire and returned to the Trust. The Evaluation Committee formed for this purpose evaluates the questionnaire filled in by the FMIS. Six candidates will be short listed. Field verification of each short-listed FMIS takes place, thereafter, comparing information provided by the candidate FMISs with that of field based information obtained from the field-verification, final scoring and evaluation would be done. To avoid the social and other biases, confounding variables were also considered in the final evaluation process and then the highest scoring FMIS was decided as the best practicing FMIS for that year. “Medani Nath Award Fund” in the name of the Director General of Department of Irrigation of Nepal was established. Fund was made available by Mr. Engineer, Lava Bhattarai, son of Mr. Medani Nath Bhattarai. The yearly Trust Award given to the best performing FMIS includes Rs. 5,000 (Five thousand) cash and a Copper Plaque. 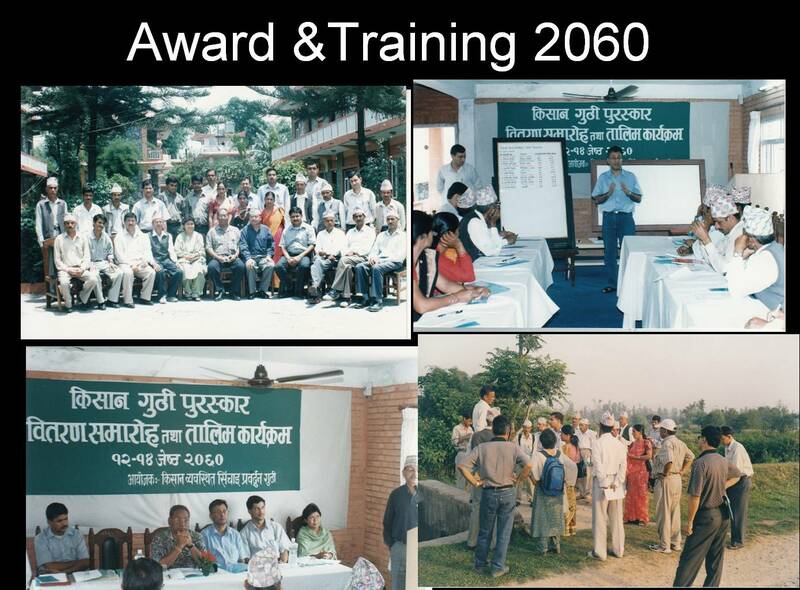 Beside this, the Trust provides training to the farmers of the award winning FMIS on the awarded theme related issues. Following training programs were organized to the best performing FMIS. Conservation Measures in Irrigation Systems. 15 farmers participated in the program. 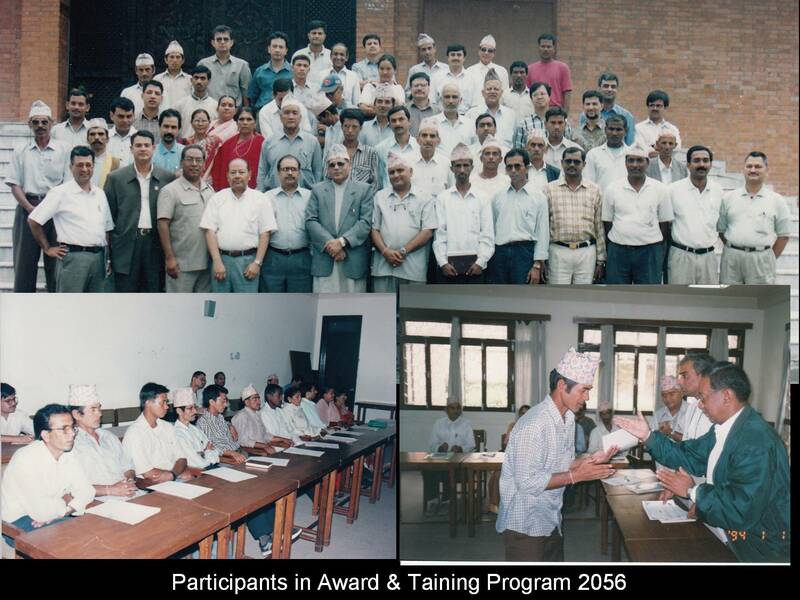 Following training programs were organized to Kathmandu District units of NFWUAN. Exercise on Organizational Strengthening of WUA to 37 farmers. Organized Farmers to Farmers Training program taking Kathmandu farmers to Argeli and Cherlung of Palpa District. Organized similar program to the farmers of Khokani Irrigation System, Khokan, Lalitpur. The Trust has database of altogether 2905 FMIS. This database includes general information of the systems and has been prepared in course of (a) developing district level inventory with the involvement of the district units of NFIWUAN (b) selecting the best practicing FMIS for the Trust award and (c) collecting information from different projects and programs. The Trust conducted two phases of research activities. These research activities were either commissioned to young researchers from other organizations and others were undertaken by FMIST itself. Besides these research activities, Trust members have been contributing research papers in a number of journals and national seminars. On request, list can be made available.